Get far away from the urban jungle to live close to nature, respecting and preserving the environment around you. 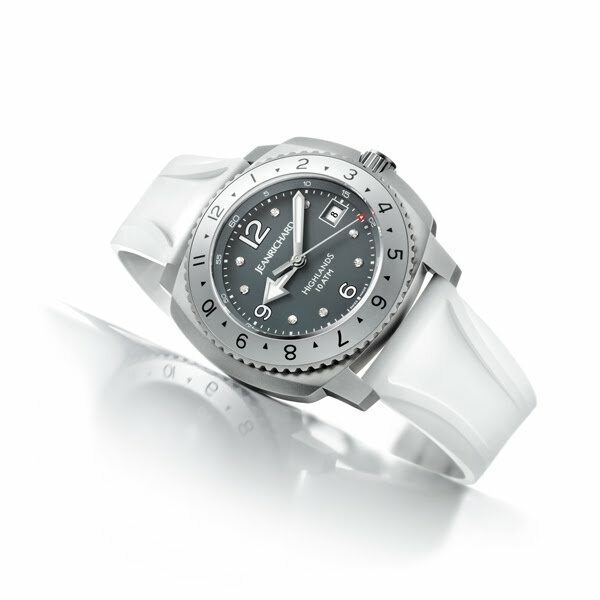 Join JEANRICHARD on a mission of exploration with the HIGHLANDS Collection, its new range of adventure watches. Elegant and racy, these mechanical self-winding timepieces come with black or anthracite-grey dials and matching natural rubber or plain fabric straps. Sculpted in sand-blasted steel, these new HIGHLANDS models with their generous dimensions (44.5 x 40mm) are resistant and its screw-down crown ensures water-resistance to 100 metres. Precision and resistance to corrosion, accidental knocks and extreme temperature changes make these watches totally reliable travelling companions. The colour choice enables the collection to merge perfectly with even the wildest of environments. The dials come in black or anthracite grey and feature luminescent hands and numerals, allowing for perfect time visibility in all circumstances. Each model is equipped with a strap made either of rubber, for a refined contemporary look, or of plain fabric, to strike a note of relaxed sophistication. To ensure maximum reliability, the buckle is fitted with an integrated safety system. As a tribute to Nick Brandt, the well-known animal photographer who embodies the HIGHLANDS Collection since 2011, JEANRICHARD also presents the Highlands Big Life Foundation watch, a limited series of 100 pieces that comes with a black PVD-coated case, combined with a green external rotating bezel allowing for the display of a second time zone. Its sober black dial features numerals in ivory-coloured luminescent material, and a signature “Big Life” indication in red. With powerful symbolism inspired by Nick Brandt’s own logo and one of his most famous photographs, an elephant transfer appears on the sapphire crystal case-back, through which can be seen the model’s JR1000 Manufacture automatic calibre. This series marks the brand’s commitment to the cause of the Big Life Foundation, created by this defender of threatened species of wildlife who has spent many years capturing his breathtaking photographic portraits of animals faced with the threat of extinction.